There has been a powerful addition to the Sony family of lenses. I finally got a chance to really play with this lens and push it to determine whether if it had any limitations like other long range zoom lenses in it's class. I wanted shoot something fast moving as well as panning then doing the same shooting fast objects while panning on a tripod. All shots provided were shot on Sony a7rII full frame and I used a MeFOTO Road Trip tripod which is ultra light yet sturdy enough to handle the weight distribution. One of the biggest I l noticed about this camera set up of the Sony a7rII + Sony FE 100-400 F4.5-5.6 GM OSS was it's weight. Sony's innovative modular exterior construction and magnesium components reduce weight and size for improved portability and mobility. I have used other DSLR's in the past with their compatible lenses and you will notice right away the DSLR's weighs significantly more than this Sony combo. Using a DSLR for a day handheld with an equivalent lens felt heavy after a while. I acquired this lens originally for wildlife, portraits, video, and long range shots. Naturally, I would use it for other creative shots but I needed to get up and close to grizzly bears without actually cuddling with them. Unfortunately, when I received the lens it was late in the season and was unable to test it for bears. I'll have to wait until they wake up in the spring. Fast focus can be a challenge with long lenses on mirrorless cameras, but Sony FE 100-400 F4.5-5.6 GM OSS utilizes two Floating AF groups – both a Direct Drive SSM and a double-linear motor – for fast AF across the entire focal range. It focuses all the way down to 3.2 ft/0.98m for 0.35x magnification at 400mm – perfect for shooting tight portraits while bringing in the surrounding background. Excellent for wildlife which is why I bought it in the first place. I decided to test it on airplanes landing while standing practically underneath them. To make it interesting I shot close to sunset or just after to test how it performed with a larger aperture up to (F 9.0), which isn't really ideal for low light, to see how it performed. I wanted an object to be speeding near me while I tested various shutter/ISO and focal lengths. Also airplanes are way cooler than cars. 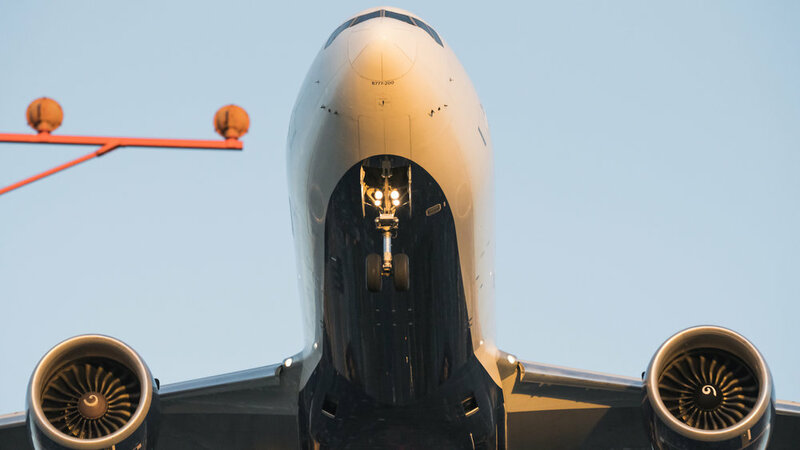 I tested the lens on airplanes flying overhead or slightly overhead seconds before touching the ground. I was at the beginning of the landing strip posts and purposefully shot this close to sunset as I wanted to see its low light capabilities vs focusing accuracy. When I shoot wildlife, for example bears come out at sunrise or sunset so low light performance is a key factor for me and my tests. 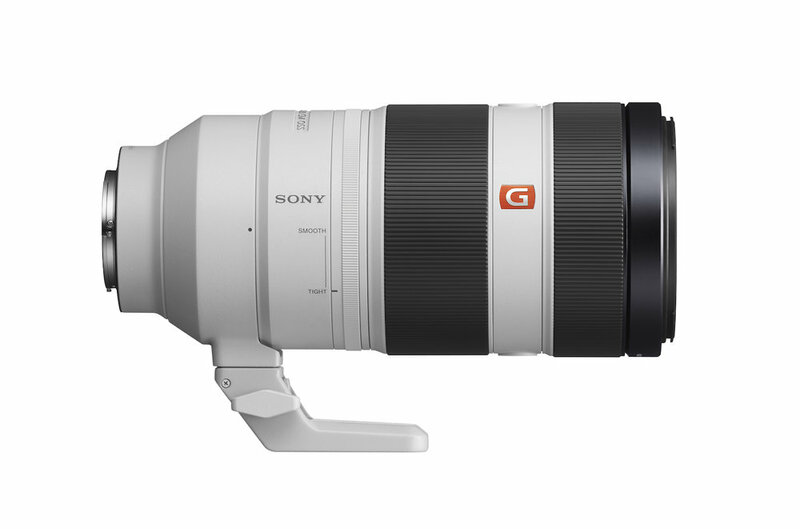 The Sony FE 100-400 F4.5-5.6 GM OSS is roughly the size of Sony FE 70-200 F2.8 GM, it’s the first Sony FE lens over 300mm (congrats Sony) and Im confident it won't be the last. I went to the LAX where I can stand underneath a runway of oncoming planes while they land. I purposely went to test out its low light focus capabilities which are a big priority for my style of shooting. First, let's look at tripod. Below are some images and I've also provided the settings for you. I used "Zone Focus Area" for these shots. All photos were shot full frame RAW. 1. Tripod @ F9.0 1/2000sec 400mm ISO 4000 Ultra Sharp focus no hunting. Landing pole left and next landing pole on right hand side of image. Demonstrating its Precision G Master optics ensure consistently high corner-to-corner resolution at any focusing distance throughout the lens’ zoom range. 2. Tripod @ F9.0 1/2000sec 203mm ISO 5000 - Ultra Sharp focus again no hunting. Landing pole on left. 4. @ F9.0 1/2000 ISO 5000 260mm - Notice the focus had no problem picking up the speeding plane just over the landing pole and following the plane for that split second while distinguishing between the landing pole and the airplane. As you can see when this lens is stable on a tripod it is razor sharp. Naturally I would've been closer to F5.6 for optimal shooting and not F9.0. But the purpose of this was to try to push the lens to see how it performed. Even in these low light conditions and an ISO much higher than I like to use it was very sharp. I was super impressed as I was underneath these planes landing and it was sunset. As you know the the tripod was only a partial stabilizer as the plane sound alone shakes the ground. These airplanes are just over the height of two lamp posts high as they fly over my head. The focus was fast and could easily distinguish between trees, poles and any of the landing poles that guide the planes in. Again, I used "Zone Focus Area" for these shots. Below are some photos of handheld panning left to right. The focus was sharp but I purposely used a lower shutter speed and lower ISO to see what I could find for limits on the speed of a plane landing - also given that the sun was either set or almost set. 5. @F5.6 1/640sec ISO 320 - 300mm. Handheld it managed to get pretty impressive focus even though I feel these settings would be too slow to "freeze" the fast moving plane. 5A. Here's a crop in of the above image to give you an idea of the focus just a little shy of an ideal shutter speed to eliminate minor blur. 6. @F8.0 1/1000sec ISO 500 - 400mm handheld you will see here upping the shutter to 1/1000sec made the plane that much sharper. Again the sun had just set. Ideally the shutter speed I would use for this fast of a moving subject would be 1/2000sec or above. 1/1000sec with low light wasn't quite enough but would perform better in optimal light conditions. Conclusion should i buy this lens? Sony FE 100-400 F4.5-5.6 GM OSS at roughly the size of a 70-200 2.8 and weighing just 49 oz, offers more reach that’s also great for shooting news, events, street and travel. While a larger 200-500mm might be better suited for the needs of wildlife photographers, when coupled with the Sony FE 1.4x teleconverter (which I haven't tested) it offers that reach without the focus issues that plague the long end of 150-600mm adapted superzooms. This lens in my opinion has so much added technology to help solve traditional problems found in other zoom lenses in this focal range. I was beyond impressed with my low light fast moving object findings. I found the focus system especially superior to other lenses I have used in this focal length. Remember I shot this with Sony a7rII 5fps full frame not a Sony a9 @20fps. All shots taken here were full frame. The a7rII having double the sensor resolution only gave me a few shots then started writing the massive resolution files to the card. Although this lens was made to go with the lightening fast a9 release. If you have an existing Sony for sports or fast moving action like the Alpha 7 series or Alpha 6000 series bodies – then the Sony FE 100-400mm f/4.5-5.6 GM OSS is an excellent choice. Disclaimer - Sony didn't compensate me for this review. This review is my opinion of what I think would be important features for my shooting style. I will add wildlife images in the spring here or on social media. I get a lot of questions about how and what I use to backup data when on an expedition. We sometimes take multiple TB or more of data between stills and video when working with a client. On a cave style expedition there is no room for error and we must have the reliability for data backups that can't fail us. Especially in moist gritty environments we cannot chance anything and must use the best. My team relies on G Technology drives and RAID system to keep client visuals safe. As part of my workflow I needed a solid solution that was rugged enough to handle 12km treks, rock climbing and extreme environments. I needed the drive space to do redundant backups while inside a cave or in my tent/campsite. Capturing images is one thing but when memory cards fail that is a whole other problem you never want to deal with. One of my “must haves” for any trip is the G-DRIVE ev ATC with Thunderbolt, a super rugged hard drive. I needed these all terrain drives with me as I journeyed through Hang Son Doong. The great part is that the G-DRIVE ev ATC hard drive stays protected while sealed inside the watertight, dust resistant shock proof case. Behind the scenes: Hang Son Doong After a day of Grit - We rely on offloading onto G-DRIVE ev ATC Thunderbolt. Performance and reliability are vital to my success as a storyteller. I have utmost confidence in G-Technology as my workflow partner for any project size or location. Plus I’m happy to say that finally, there’s a solution to accommodate my field needs and grows with my team as we grow.